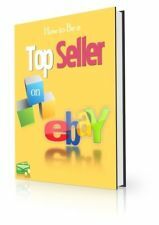 How to Become a Top Seller on eBay + Resale Rights! Did you know that you can find nearly anything and everything that you’d want to purchase on eBay? From used cars to a pepper grinder made from a stuffed raccoon—eBay has become the world’s marketplace. From high class and high priced to trailer trash chic and selling for pennies, anything you want is at your fingertips. Some say it’s like a world-wide garage sale and that’s not far wrong! People come to eBay by the millions!! Do you see where I’m going with this? Are you selling on eBay yet? You’re not? Not smart. There is money to be made on eBay—big money. It’s there for the taking and if you’re not there you’re missing out on one of the biggest gold rushes of this century. You need to become a Top Seller and this book will show you how step-by-step! eBooks are digital media that are read by computers, e-book readers, or other hardware that reads computer file formats. You will not be able to read the eBook without one of these devices. It will not "play" on your DVD player, nor will it "play" on an MP3 or iPod. Printing of all or part of any eBook can be done from your computer, if you so desire. Otherwise, you may simply use your computer as a screen reader. Printing will take regular size copy paper 8 1/2" x 11". 2. Text files (.txt); you will need a word processing program such as Word, Works, etc. 3. Executable formats (.exe), using WinZip or other extractor program. WinZip offers a free trial. Others may be available free of charge from other sources. You may already have an extractor on your computer; many are built in to Windows.